Mexican flavors galore! 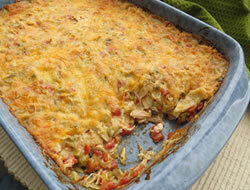 This fun cheese and bean casserole can be served at a party buffet or simply for a family meal. And, the leftovers can be reheated quickly in the microwave. 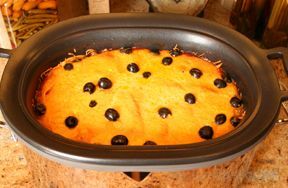 Lightly spray baking dish with no-stick cooking spray. Cut 11 inch diameter flour tortillas into 1/2 inch wide strips. Spread all the tortilla chips over the bottom of the dish. 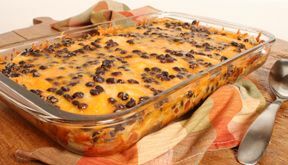 Layer in the following order: half of black beans (15 oz), 2 cups of cheese, and half of the flour tortilla strips. Then add the chicken and pour the 3 cups of salsa over the it. 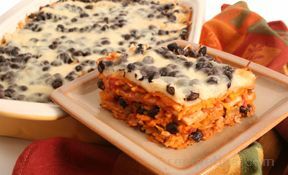 Next, layer in the following order: 2 cups of cheese, remaining flour tortilla strips, and remaining (15 oz) of black beans. Spread 2 cups of cheese over top. Cover with foil* and bake 50 minutes. Uncover and bake an additional 10 minutes. Serve with extra salsa if desired. *Spray foil with cooking spray to prevent cheese from sticking.